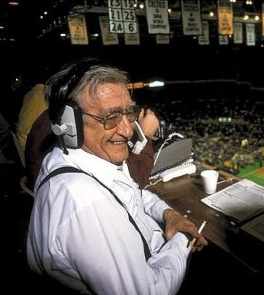 For 37 years, Johnny Most was our eyes and ears at Boston Garden and around the league cities, as the iconic, gravel-voiced, outrageously partial, play by play radio announcer for the Boston Celtics. For 37 years, Johnny Most was our eyes and ears at Boston Garden and around the league cities, as the iconic, gravel-voiced, outrageously partial, play by play radio announcer for the Boston Celtics. He began during pro basketball’s and the team’s lean, uncertain years educating thousands of listeners and getting them out to the games. Alone in the booth for most of those early years, his delivery and reporting style brought the game to life. He called the team’s first championship series in the late 50s and over a dozen more during the glory years that followed. Johnny relished every Celtics score and no one — not an opposing player, coach or a referee — escaped his scathing criticisms and outrage if he saw a deliberate or unnecessary foul. His “Havlicek stole the ball!” call in the 1965 Eastern Conference Finals is one of the most recognized audio clips in the history of broadcast sports.